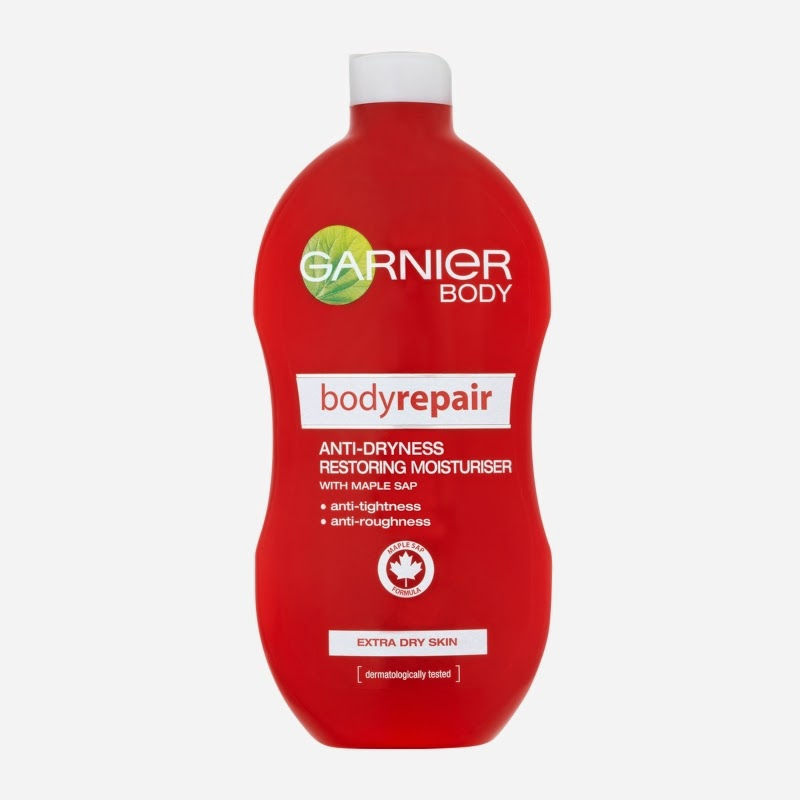 It may have been the bright red packaging of Garnier BodyRepair Repairing Cream with Maple Sap-Nourishes and Repairs Skin Intensively-Extra Dry Skin, 50 ml that caught my eye as a strolled down the aisle of the DM drugstore while I was recently in the Austria area for the holidays. Or it may have been these two words that caught my attention : "MAPLE SAP"
In the U.S. Maple is most often referenced in terms of the syrup that goes on our pancakes, and of course the famous Canadian version :). But it turns out that the Maple tree produces a sap whose properties are actually very beneficial to dry skin. Combined with a non-greasy, fast absorbing blend of Shea butter, this has become one of my new body care favorites for 2015! This product did wonders for areas like my feet, elbows, lower legs and neck/hands as well. The texture of the product in the tub is creamy and thick, but very lightweight. There is a slightly sweet scent, which I found pleasant and fresh, and absorbed rather quickly, so it didn't interfere with any other fragrances, etc. It's quite concentrated, and has it's nice amount of slip, so a little went a long way. If you have dry or very dry chronic skin, this is the perfect product for you. This is also recommended for dry patches and mild eczema as well. I loved the soft, supple finish of my skin after applying. And I got all day moisture even in very cold/dry temps. This is a also a great cream to add to feet and heels after an at home pedicure. Note: The 50 ml tub packaging seen above only seems to be currently available in most Central and Eastern European countries. There is slightly different Body Repair lotion formula in a bottle, available at big drugstores in Italy, as well as in the UK at Boots drugstore. I've also found it online in the US here. It's about 6 pounds, 4 Euros or $10 dollars.